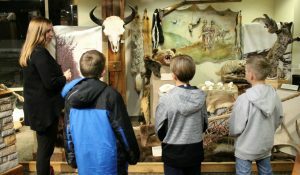 Ethan Jenks, Wesley Crowshaw and Zack Allman study the Native American artifacts at the Hyrum City Museum with their Cub Scout group recently. 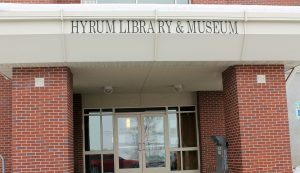 The Hyrum City Museum, located at 50 W. Main St, is housed underneath the city’s library. 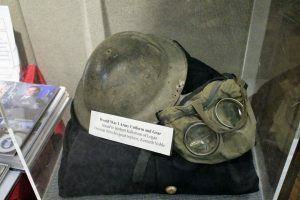 The museum provides resources and services in a variety of media to help people in Cache Valley understand their history. The city has had a museum since the 1980’s; up until 2012 it was run by members of the community. The Hyrum City Museum located at 50 W Main St, is the only facility like it in the valley, they provide a variety of media to help people understand Cache Valley history. Cropper said the city council members are all good to work with and they are the biggest museum in the county. On display they have arrowheads and other relics from the Northwestern Band of the Shoshone, and a diagram of their migration patterns in northern Utah, Idaho and Wyoming. There is also a digital exhibition of Shoshone songs and photos. The children will do crafts, and usually they will get a fun treat. Van Huss also understands the history of Cache Valley and enjoys talking with visitors about the different displays. Hyrum City Museum Director Jami J. Van Huss talks with a cub scout group about the meaning of Cache Valley and the display of animal skins. One of the library board members, Steve Downs, is a model railroader and he agreed to help with the display. Hyrum averages about 4,000 visitors to the museum each year. If people want to know about any of Hyrum City Museum’s upcoming events, including new exhibit openings and kids activities, they can look the museum up at hyrumcitymuseum.org or like @hyrumcitymuseum on Facebook.